The grand opening of the Wissahickon High School Athletic Complex was held in November 2018. 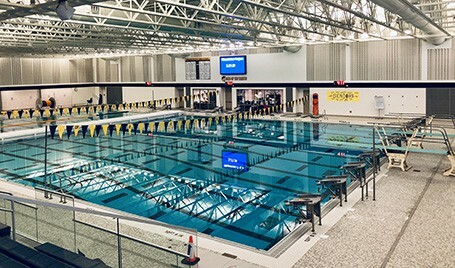 The natatorium was part of a $23 million project that included a new Central Plant comprising heating and cooling elements, an emergency generator, and pool pump and filtration system. The new 9,290 sq. ft. swimming pool will be used for swimming and diving competitions, water polo matches, and recreational activities. The 10 lane, stretch-25 configuration can accommodate diving and swimming meets simultaneously, with a spectator capacity of over 350 people. The pool measures 75 ft. by 120 ft. (9,000 sq. ft.) and includes a bulkhead and springboard diving. The Central Plant component replaces the original school mechanical equipment that had outlived its project lifecycle and took about 18 months to complete. This project provided more efficient sources of heating and cooling for the entire high school and allows for more flexibility in future construction and improvements to the high school campus. This addition interfaces with the existing school with a new entry lobby that will support both the pool and Wissahickon’s existing Round Gym, an iconic symbol of the school’s athletic program.